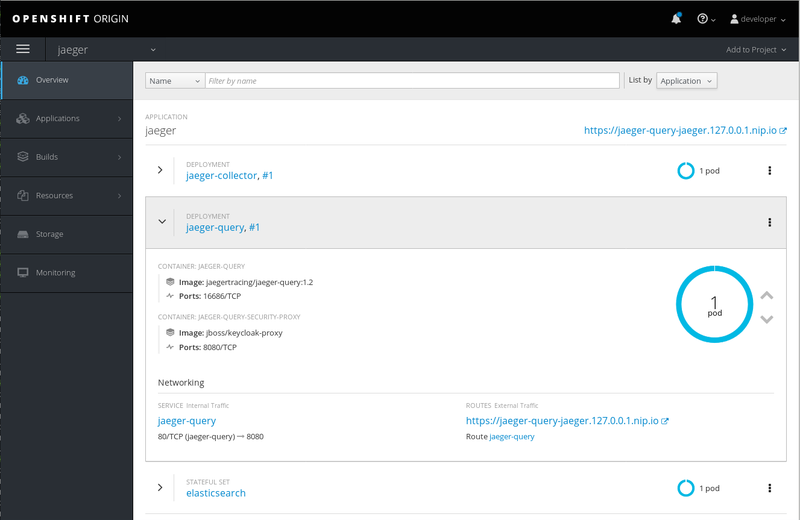 Note: This blog post is an update of a similar one published last year, with the instructions updated to catch up with the software updates that happened since, as well as with the changes made to the OpenShift template for Jaeger. A Keycloak (or Red Hat SSO) server instance running. Note that we are not trying to secure the communication between the components, like from the Agent to the Collector. For this scenario, there are other techniques that can be used, such as mutual authentication via certificates, employing Istio or other similar tools. Set the Access Type to confidential and * as Valid Redirect URIs and save it. You might want to fine tune this in a production environment, otherwise you might be open to an attack known as “Unvalidated Redirects and Forwards”. The last property, confidential-port, will need to be manually removed later on. For this demo, we assume you have an OpenShift cluster running already. If you don’t, then you might want to check out tools like minishift. If you are running a recent version of Fedora, CentOS or Red Hat Enterprise Linux you might want to install the package origin-clients and run oc cluster up. This should get you a basic OpenShift cluster running locally, available at https://127.0.0.1:8443 . You can login using developer as both the login and the password. We’ll use the Jaeger OpenShift Production template as the starting point: either clone the entire repository, or just get a local version of the template. The secret within the credentials should match the secret we got from Keycloak at the beginning of this exercise, as well as the auth-server-url. Attention: The value for the auth-server-url should be a location that is reachable by both your browser and by the sidecar, like your host’s LAN IP (192.x, 10.x). localhost/127.x is not going to work. As a reference, here’s the complete template file and ConfigMap file that can be used for this blog post. During the first couple of minutes, it’s OK if the pods jaeger-query and jaeger-collector fail, as Elasticsearch will still be booting. Eventually, the service should be up and running, as shown in the following image. Once it is ready to serve requests, click on URL for the route (https://jaeger-query-jaeger.127.0.0.1.nip.io). You should be presented with a login screen, served by the Keycloak server. Login with the credentials you set on the previous steps, and you should reach the regular Jaeger UI. 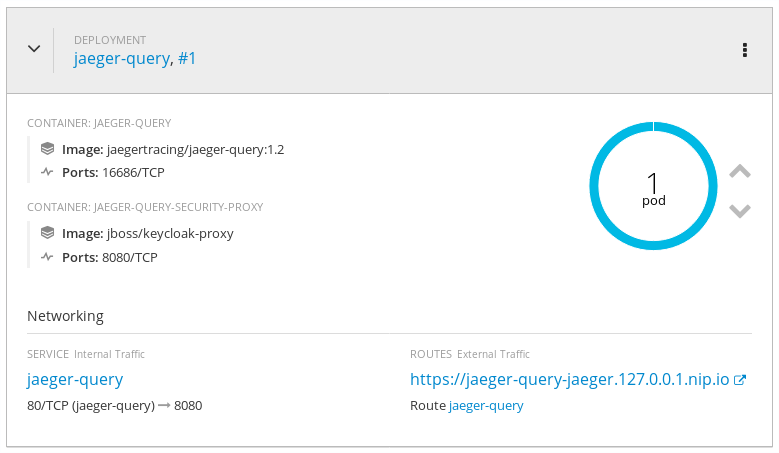 In this exercise, we’ve seen how to add a security proxy to our Jaeger Query pod as a sidecar. All incoming requests go through this sidecar and all features available in Keycloak can be used transparently, such as 2-Factor authentication, service accounts, single sign-on, brute force attack protection, LDAP support and much more.